A few weeks ago, I stopped at Insomnia Cookies for some late night cookies. As I was getting in the car, I noticed a sign in the window of the Den Party Store. 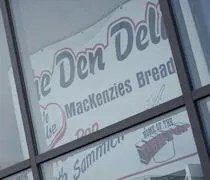 It appeared there was some sort of deli inside and they make their sandwiches with MacKenzie Bread. This afternoon, J and L laid down for a nap not long after J got home from work. I was a little hungry and I’ve been wanting to look for some Greenbush Brewing bottles now that they’ve started bottling one of my favorite Black IPA’s. 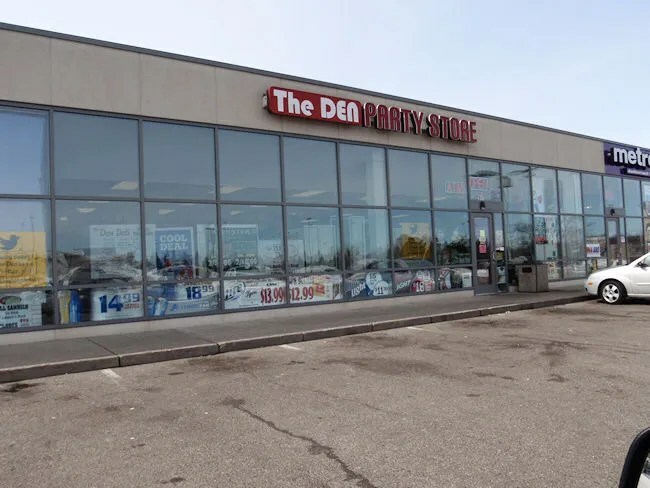 The Den Deli is in the back corner of The Den Party store in the Campus Pointe Mall. I noticed it right away when I walked in the door, but first, I headed over to the beer coolers to see if they had the beer I was looking for. To my surprise, there was even a sign on the cooler door advertising that they now sell Greenbush beer. I picked a six pack up to see the price, but wanted to go get a couple sandwiches before carrying a six pack around the store. The deli isn’t much more than a couple portable sandwich carts and a fridge. However, it seems to be pretty popular on campus. Even though most of the students are on spring break, there was still a line four people deep. 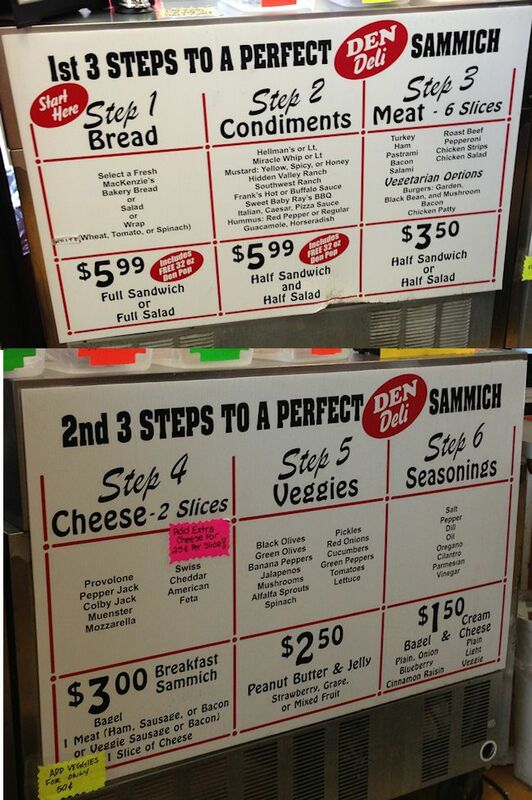 Like a lot of college town sandwich places, the Den has a process laid out for ordering. All of the sandwiches are custom made and there are no pre-set options. The process starts by picking out bread. They have all the bread options on display on top of the counter. After that, you pick condiments then meats followed by cheese, veggies, and seasonings. I was getting sandwiches for both J and myself. I asked the “sammich” maker if he wanted to do one then go back or just do them both at the same time. He said he could do them both so that’s what we did. I did both sandwiches on Italian bread. My plan was to get myself a Pastrami sandwich, but after I put the spicy mustard on the bread, I found out they were out of pastrami. 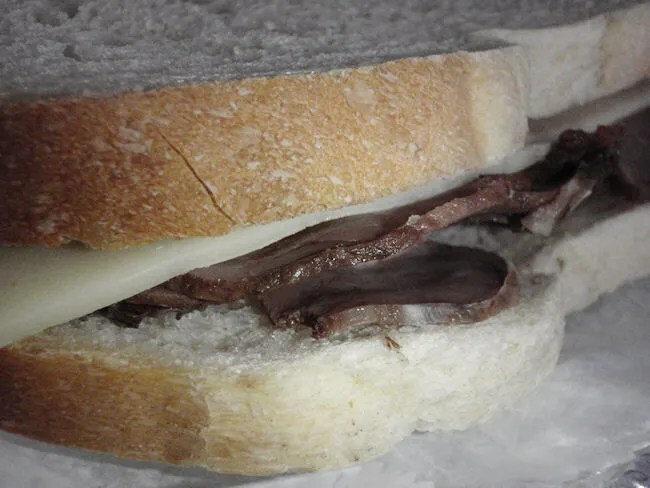 That was alright…I just went with roast beef instead. I finished my sandwich off a slice of swiss cheese and passed on the veggies. The sandwich I got for J was a little more involved. 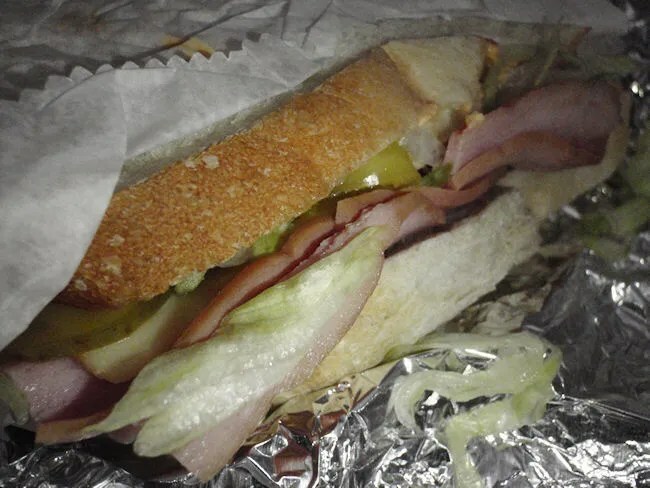 I started with red pepper hummus then added ham, lettuce, pickles, and banana peppers. The sandwiches were wrapped up individually in foil then handed over to me. I could have gotten a 32 oz pop and a bag of chips for each sandwich, but I didn’t really want the chips and didn’t need two pops. I did take one of the pops and got myself a Pepsi before going back and grabbing the six pack of Anger that I came in for. The two sandwiches cost about $11 and they’re paid for at the front counter. When I got home, I unwrapped the foil to find a pretty delicious roast beef sandwich. The MacKenzie’s bread was, of course, fantastic. The spicy mustard and roast beef are such a great pairing. Because I’m not much of a veggies guy, the sandwich was a little thin, but that’s sort of my own fault. The sandwich, as I got it, was pretty good. It was a little while longer before J got up from her nap, but her sandwich was there waiting for her. Since there were more veggies on hers, the sandwich was much more substantial and more filling. She said the sandwich was different and the red pepper hummus was by far the dominate flavor. I asked if that was a good different or a bad different and she said good. The Den Deli was an unexpected find for me. I was curious after seeing the sign in the window and since I wanted to buy some beer anyway, I decided to see what it was all about. It’s a great place to grab a quick sandwich on campus and even the teachers and staff seem to know about it. There were two WMU public safety officers in front of me. That’s always a good endorsement for a place. It’s not a knock your socks off deli, but it does offer some quality food and they’re open late.